Boil a pot of water, add salt and cook the black rice for the time indicated in the package. Meanwhile, wash the zucchini and peppers, cut into cubes and season it all in a bowl with olive oil, a pinch of salt and a handful of dried oregano. When 10 minutes are left from the end of the cooking of the rice pre-cool LIFE, the domestic blast chiller. When cooked, drain the rice and pour it into a steel bowl, then start the blast chilling cycle. Arrange the vegetables on a baking dish and cook it in the oven at 200 ° C for 15 minutes. After cooking blast chill the vegetables with LIFE to keep crunchiness and nutrients. When rice and vegetables will be blast chilled put all together in a bowl and mix so the sauce is evenly distributed. 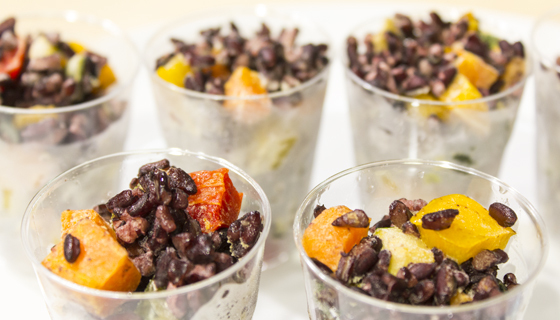 Kept in the fridge and serve the Venere black rice salad with a drizzle of raw oil. If you want to have rice available for a long time split into individual portions and blast freeze it with the blast chiller. In a few minutes it will be thawed and ready to be served!